Although plant sterols (phytosterols) and cholesterol have similar chemical structures, they differ markedly in their synthesis, intestinal absorption, and metabolic fate. Phytosterols inhibit intestinal cholesterol absorption, thereby lowering plasma and low-density lipoprotein (LDL) cholesterol levels. (Mayo Clinic Proc. 78:965-78 2003). In a review of 16 published human studies using phytosterols to reduce plasma cholesterol levels in 590 subjects, phytosterol therapy was accompanied by an average 10% reduction in total cholesterol and a corres-ponding 13% reduction in LDL cholesterol. (Am.J.Medicine;1999107(6):588-94.Review). 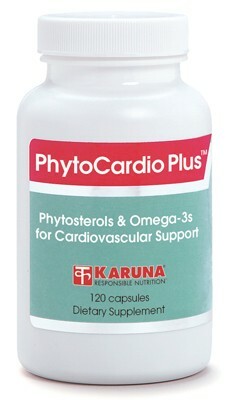 Non-esterfied phytosterols may be more effective at helping to support heart health. Non-esterified dietary phytosterols compete with dietary cholesterol for micellarization, as well as the absorption of biliary cholesterol. (Nutr. Res. 2006;26:579–584). The competition of phytosterols with cholesterol micellarization occurs with free sterols only and require phytosterol esters to first be hydrolyzed in the gut before they are able to help reduce the solubility of cholesterol. (J Lipid Res. 1987; 28:1144–1155). 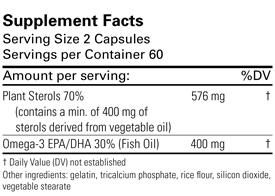 Clinical studies combining phytosterols with diets rich in fish oil or high-oleic sunflower oil significantly lowered LDL cholesterol; however, only the fish oil and phytosterol combination lowered both serum triglycerides and LDL cholesterol. (Curr Atheroscler Rep. 2008 Dec; 10(6):467-72). Current research has demonstrated that the consumption of a combination of low-dose Omega-3 and plant sterols can effectively reduce both LDL-cholesterol and triglyceride levels in individuals. (J.Nutr.2014; 144(10):1564-70). Suggested use for adults: Two capsules twice daily with a meal, or as directed.